The F-15E Strike Eagle from the United States air Force are designed for air-to-air combats and air-to-ground missions with precision ammunition. 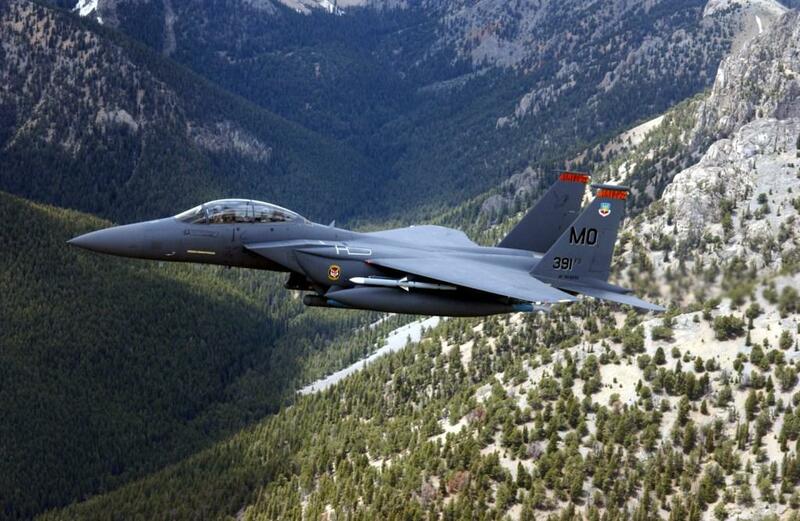 The F-15E can fight his way over long distances to destroy enemy ground targets and fight his way back safely. 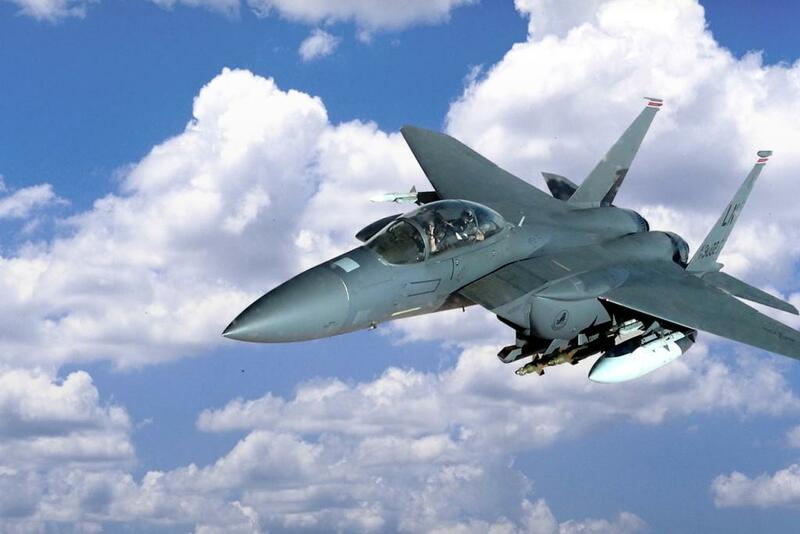 The main difference with the F-16 is that the F-15E is much more expensive, twin-engine, larger, larger thrust-to-weight ratio and was build on the basis of the F-15A/C interceptor which was the most advanced us fighter jet before. The F-15E is featured by a superior maneuverability and acceleration. The F-15 was the first American operational aircraft whose engines' thrust exceeded the plane's loaded weight, permitting it to accelerate, even while in vertical climb. Low-wing loading (the ratio of aircraft weight to its wing surface) is a vital factor in maneuverability and combined with the high thrust-to-weight ratio, it enables the aircraft to turn tightly without losing speed. With the F-22 Raptor, the F-15E is the second most expensive fighter jet ever. This is why mostly all countries can not purchase the F-15. Only U.S. allies with high priorities are having the F-15. Thanks to the F-15I, Israel has the most powerful air force in the whole Middle-East. For Japan and South-Korea, is North-Korea the biggest threat for the local safety. The crew of a F-15E contains a pilot and weapon officer. 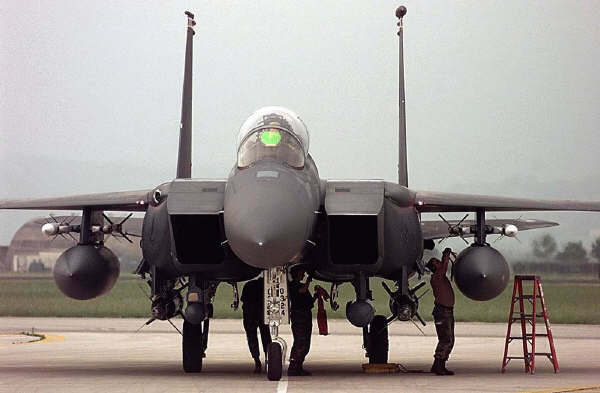 F-15E's have been used during the invasion of Iraq in 2003 (Operation Iraqi Freedom). The crew consists of a pilot and a weapon officer. 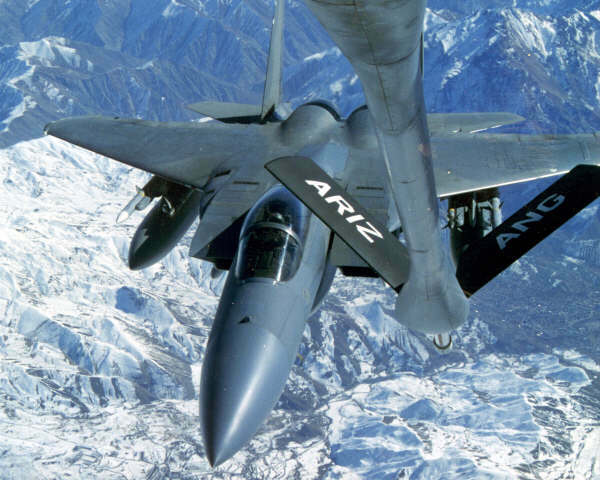 The F-15E can perform air-to-air missions and air-to-ground missions. When the crew has detect a target on the ground they can "freeze" it in a map in the computer. Than they turn back to the air-to-air mode to destroy possible enemy aircraft. When they are finished they go back to the air-to-surface mode to destroy the ground target. When the weapon officer pilot is busy with the ground target, the pilot can search for other enemy aircraft. Characteristic is the place of the weapon officer. He has 4 displays where he get all the information from: the radar, electronic warfare or infrared sensors, aircraft information of weapon information and possible threats. Whit the head-up display the pilot can - by day and night - all the flight and tactical information see without looking in the cockpit. Whit a forward looking sensor the pilot can see by night pictures with the same quality as by daylight. With a LANTIRN system the pilot can fly low by day and night to attack ground targets. This navigation pod contains a terrain follow radar which informants the pilot by low flying. The F-15E has 2 Pratt & Whitney engines which have a fully digital engine control system. These engine can accelerate very quick which is essential in air-to-air fights. Under the Radar Modernization Program (RMP), The US Air Force replaces the APG-70 radar by the APG-82(V)1 radar. The Low rate Initial Production Phase started in 2012. The weapons can be mounted on a ECM pod. At 1 ECM pod can be mounted multiple bombs. 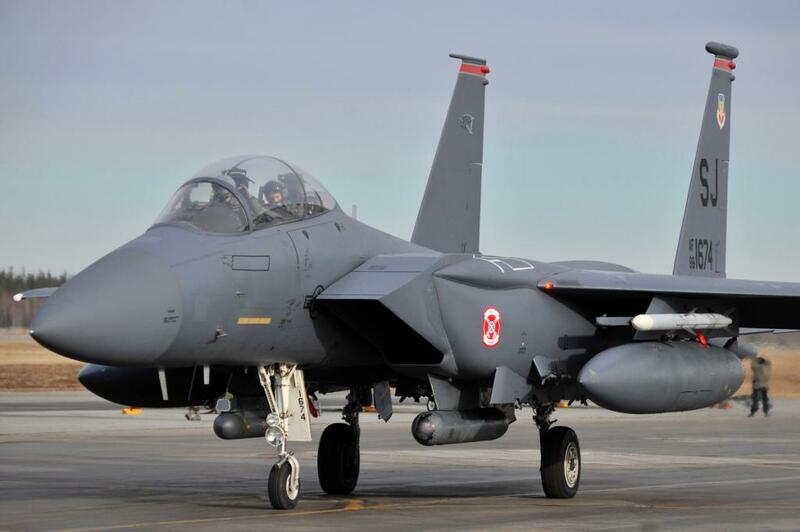 The F-15E can be armored with a combination of weapons like four AIM-7F/M Sparrow missiles and four AIM-9L/M Sidewinder missiles or 8x AIM-120 AMRAAM missiles. Furthermore it can carry all air-to-surface weapons in the US Air Force inventory. Some dumb bombs are: Mk-82 "Snakeye", Mk 20 "Rockeye", CBU-52B, CBU-58B, CBU-71B and the Mk-84. Some smart bombs are: CBU-10, CBU-12, CBU-15 or another laser, electro-optical, or infrared guided bomb inclusive the AGM-65 Maverick air-to-surface missiles. Design organisation McDonnell Douglas Corp.
1000 nm, 1853 km max. The F-15E Strike Eagles from the USA are part of the United States Air Force (USAF). At the moment the USAF has about 217 F-15E Strike Eagles. 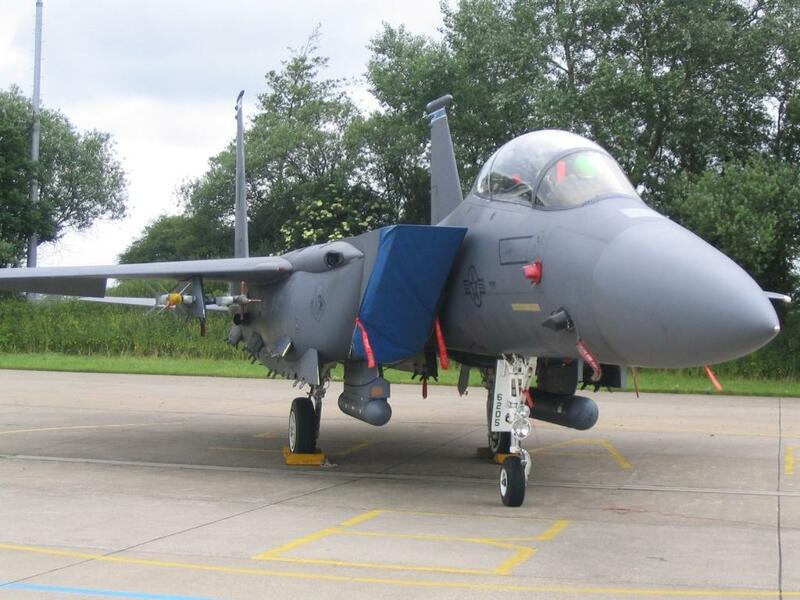 In April 1988 the first F-15E strike eagle was delivered to the 405th Tactical Training Wing, on Luke Air Force Base. - on USAF bases in the United States. - on RAF Lakenheath Base in the United-Kingdom as part of the U.S. European Command. On that base the F-15E's are grouped by the 494 squadron and 492 squadron. These squadrons are combat ready for strategic attack mission, interdiction missions, air support for of USAFE, USEUCOM and NATO operations. They can be equipped with the full capacity of air-to-air and air-to surface missiles which are the most advanced precision weapon of the USAF. - by the 90th squadron, 3rd Operations Group on Elmendorf AFB in Alaska. 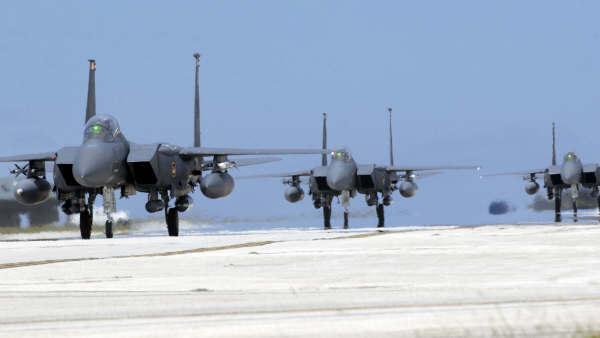 The squadron is combat-ready for rapidly deployment of a F-15E squadron to do precision engagements of enemy ground targets. 1 F-15E Strike Eagle was shot down during Operation Iraqi Freedom (2003).